Maoist supporters rally against the government. There’s been so much news from Nepal in the past 48 hours I barely know where to begin! Since there’s so much of it it’s possible that I’ll give an incomplete view of some developments, but that’s probably unavoidable. Either way, there’s been a hell of a lot happening and it’s worth keeping up with it. To start things off, Maoist cadres attacked Finance Minister Surendra Pandey, hurling stones at his car as he attended a function which they disrupted, raising black flags as a sign of protest. The attack was in response to remarks he made earlier in the day at the UML’s party convention. Apparently, he claimed that the Maoists will be unable to destabilise the government as it has earned the support of it’s coalition partners by making all the Madhesi party leaders government ministers, and he was reported as saying “Leave the issue of toppling the government. Homework is being carried out to make all the 26 parties participate in the government”. Considering how unstable a government made up of that many parties inevitably must be, and also considering the new developments in the internal struggle within the UML party (more on that later), this government is a weak and insecure one regardless of how many times it expands it cabinet. The Maoist-affiliated All Nepal National Independent Student’s Union – Revolutionary (ANNISU-R) has declared an indefinite shutdown of all private “higher secondary” schools in Nepal. The ANNISU – R organises students in high schools as well as universities, and it’s candidates were elected to the leadership of student unions across Nepal recently. It is demanding an increased number of teachers be allocated to public schools rather than private ones, the domain of a privileged few. The Maoists continue to alternate demands for a national government to be formed under the leadership of their party with threats of revolt if this does not happen (as well as assurances that even the formation of a new national government will only be a means for them to move towards full blown popular revolt). Vice-Chair of the party (which has recently adopted a system of multiple vice-chairs and a more collective form of leadership) Baburam Bhattarai stated that there is “no alternative” to a Maoist-led government. He said that if this does not happen, it will be impossible to move forward with the peace process and the drafting of a new constitution. However, he also stressed that the formation of such a government will be impossible unless President Yadav is “corrected” for blocking the previous Maoist-led government’s move to fire General Katawal, head of the army, which the Maoists have described as unconstitutional and anti-people, and which led to them resigning from government. It’s worth going into this seemingly simple demand a bit deeper. Since the President blocked the firing back in April this year, General Katawal has actually retired anyway and been replaced by someone else. The Maoists have so far been hazy on the details of how this action by the President can concretely be “corrected”, although they have been consistent in raising the demand that the issues of civilian supremacy this decision raised be debated in the house. So far the government has refused to allow such a debate to take place, and the Maoists have taken to the streets and prevented the sitting of parliament with increasingly militant rhetoric under the general slogan of “civilian supremacy”. Since Katawal has already resigned, the Maoists are obviously not calling for their original move to be carried out – the results it sought have already been achieved. So the question is, why the focus on President Yadav? Why the constant return to this issue? I don’t have any definitive answers, but perhaps the Maoists are using this as part of their strategy to convince the masses that change cannot be achieved solely through the halls of parliament. 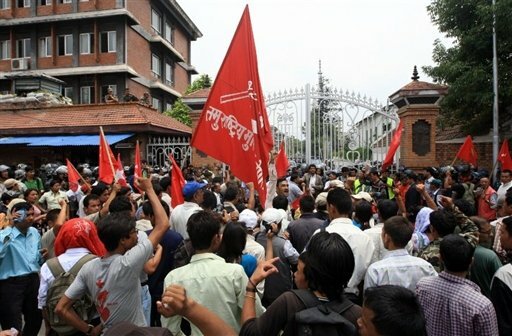 By focusing on this event, where the President went beyond his mandate to block a move by a democratically elected civilian government that the army disagreed with, the Maoists are trying to convince the masses that under the current form of government and form of society that exists in Nepal, “civilian supremacy” will not be possible. Revolutions do not take place when the leaders of a party just make theoretical demands for “the dictatorship of the proletariat” etc. They happen when a concrete, practical set of demands is put forward which the masses identify with and see for themselves cannot be achieved without revolution. In Russia it was “land, bread, peace”, and in Nepal it may be “civilian supremacy”. Considering the abuses the Nepali people have suffered at the hands of the military, this is a demand with real significance to them. Bhattarai referred to the President’s move in his speech as a “coup”, and said that the “People’s movement will intensify if the regression is not corrected.” He also condemned the governments moves to import weapons from India, a move he denounced as being against the peace process. He also made some interesting remarks about freedom of the press, saying that “”the press is free when journalists control the press, however, such is not the condition in Nepal.” This is in contrast to the widely held view in the capitalist West that a privately owned press is a free one, as compared to a state controlled and therefore unfree press. Bhattarai is saying that a press owned by wealthy corporations and individuals is not free, as it’s content is determined by and reflects the class interests of it’s owners. Similar comments were made by Prachanda in a widely reported speech to a Maoist mass gathering on Saturday. Telegraph Nepal wrote that “Prachanda has said that the stage is set for the Maoists’ led uprising to come to an end,” and reported him as saying that “We are marching along cautiously to bring an end to the Peoples’ Revolution, the stage is set for the final showdown… People are less hopeful that the Constitution will be drafted on time, it is the wish of the people that forced us to take to the streets”. Nepalnews also published an article on the speech, writing that Prachanda said the time is ripe for “new communist revolution”. 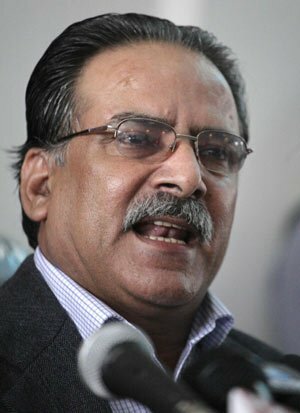 The UCPN (M) Chairman reportedly warned the ruling feudalist and bourgeois parties that the current protest movement the Maoists are leading could turn into a “decisive communist revolution if the parties tried to block the country’s political transformation.” Prachanda went on to say that the Maoists “will create a storm of revolt,” and the current agitation is just a “prelude” to this. 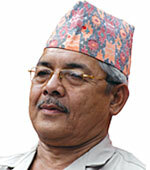 Bhattarai made two other speeches worth taking a look at. During a press conference, he reportedly echoed Prachanda and said that the current protest movement is merely “a preliminary exercise towards yet another revolt.” The Maoist leader stated “this is just the rehearsal of the blizzard that awaits the country”, and claimed “the incumbent government is in a mood to impose war on us, we want things settle amicably, however, they want just the otherwise… they want to declare emergency and rule the country ad infinitum”. In a seperate speech given to a Maoist mass gathering, he slammed the leaders of Nepal’s parliament as “criminals”, accusing President Yadav of being the “new avatar of [former king] Gyanendra”, and warning that Yadav will have a “fate similar to Gyanendra”. He also claimed that the government is “conspiring to dissolve the Constituent Assembly”, which when coupled with the declaration a few days ago by another senior Maoist leader called Gajurel that if the CA was dissolved the Maoist would “capture the state” is a big call to make. A major political struggle is also beginning in Nepal over how the judiciary will be organised once the constitution is written. The Maoists have successfully sought the support of the Madhesi parties to win a majority vote in a committee set up to put together a document proposing how the judicial system should operate in the New Nepal. In their proposal, My Republic reports that they have put forward “parliament as the final interpreter of the constitution besides also proposing appointment of the chief justice by parliament from outside the judicial service.” Various reactionary parties are aghast at this, claiming that an “independent” judiciary is necessary and that this would open up the judiciary to political manipulation. However, this is a move to ensure democracy. In a nation of extreme poverty very few people are able to attain the education and experience necessary to qualify as a lawyer, let alone a judge, and therefore the judiciary is overwhelmingly made up of people from a privileged, upper class background. By allowing for the elected representatives of the people to appoint (and presumably force from their position) judges, the Maoists are struggling to ensure that the nations laws and the application of these laws will reflect the will and class interests of the working masses, not the privileged few. I’ve published some reports on the internal struggle taking place in the UML party (a reformist, revisionist CP) over the past few weeks. It should be kept in mind that what knowledge I have of this struggle has been gained through scattered, unclear reports translated into English and filtered through the bourgeois media, but from what I can gather, the struggle appears to be between, on the one hand, a current gathered around party Chairman Khanal and Vice-Chair Gautam, who both are seen as being relatively friendly to the Maoists, and senior party leader Oli, who is closer to the Nepal Congress and bitterly hostile to the Maoists. There has been a round of purges and reorganisations as Khanal tries to undermine Oli’s faction, and there is the possibility of a split. He stated that “continued wrangling between the parties will make sure that the country will not get the Constitution on time, the responsibility for the failure will be that of the UML as it is currently leading the government”, and added that “In that eventuality, the country will be ruled by the Feudal, Rightists and the Imperialists.” He concluded by warning the UML cadres that if the constitution was not drafted on time it would make possible the restoration of the monarchy, and said that the Maoists must be brought back into the “politics of consensus” in order to avoid another civil war. Socialist Revolutionary Party. It split between it’s left wing elements, the Left SRs, who for a time formed a coalition government with the Bolsheviks and cooperated in the revolution, and the right-wing SRs who joined the White Armies and fought to crush the revolution. The UML is similar in many ways to the SRs – it’s a party with many grassroots cadre who do genuinely believe in socialist revolution, despite the petit-bourgeois nature of its leadership and political line. If the UML splits down Left/Right lines, it would have a big impact on the political landscape in Nepal, and could make the Maoist’s task a whole lot easier. I guess we just have to wait and see what happens. All in all, an eventful and exciting 48 hours. The fiery rhetoric of the Maoist leadership continues, a parallel state has been revived, a set of 45 demands have been presented mirroring the ones on the basis of which the People’s War was launched… Things just keep getting hotter in Nepal.